An outdoor pavilion is the perfect way to enjoy breezy afternoons and sunset dinners at your home. A new pavilion, gazebo, or pergola will extend your usable outdoor space, add to your curb appeal, and boost the value of your home. Carroll Landscaping provides our customers with top-notch pavilion design, installation, and maintenance. 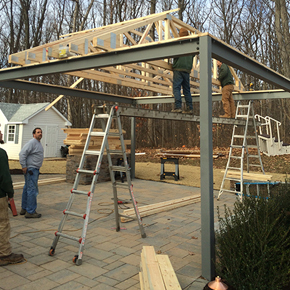 Here is what a typical pavilion installation process looks like. The pavilion installation process starts with a design meeting to determine the size of the pavilion, your personal style, any constraints, and the budget. Our landscape designers will walk through your property to assess how much site work will be needed, the best location for the structure, and how to best integrate the pavilion into your existing landscaping and hardscaping. We always take into account the existing layout and elevation of your yard to ensure that a new pavilion will not lead to any drainage issues in the future. Once the design and planning phase concludes, we will enter the scheduling stage. With the final pavilion design in-hand, our team will procure the necessary materials and schedule a date for your pavilion installation. Some homeowners are surprised to learn that there is typically a multi-week period of lead time required for an installation. Keep in mind that a landscape contractor who is always free is always free for a reason! On the scheduled pavilion installation day, our installation crew will show up on time with all of the necessary materials. First, our workers will complete any necessary site work to prepare your yard for the pavilion installation. If there is debris or plant material that needs to be removed from the area, we will dispose of it properly or discuss replanting options with you. If you need an existing hardscaping structure removed to make room for the gazebo or pavilion, we will also take care of the removal and disposal. Once the installation site is properly prepared, we will lay the base for your pavilion and begin the installation process. 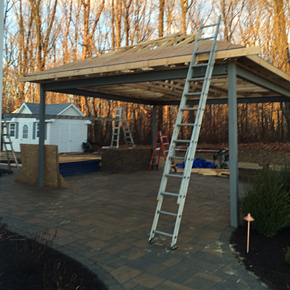 If your pavilion or gazebo installation is a multi-day project, our workers will always find an appropriate stopping point and thoroughly clean the area before leaving. On the last day of installation, our team will ensure that your final pavilion matches the original specifications and your vision, that the area is cleaned up, and that your yard is put back together properly. We always leave our clients with a ready-to-use finished product so you can eat dinner in your new pavilion that night if you would like! If necessary, we will give you maintenance instructions to take proper care of your pavilion.